New Zealand Proper Crisps know you deserve real food. You shouldn’t have to settle for over-processed, artificially flavored potato chips, you’re worthy of crisps without compromise! And that’s exactly what they deliver at Proper Crisps. There’s a reason they’re the fastest growing snack company in New Zealand. 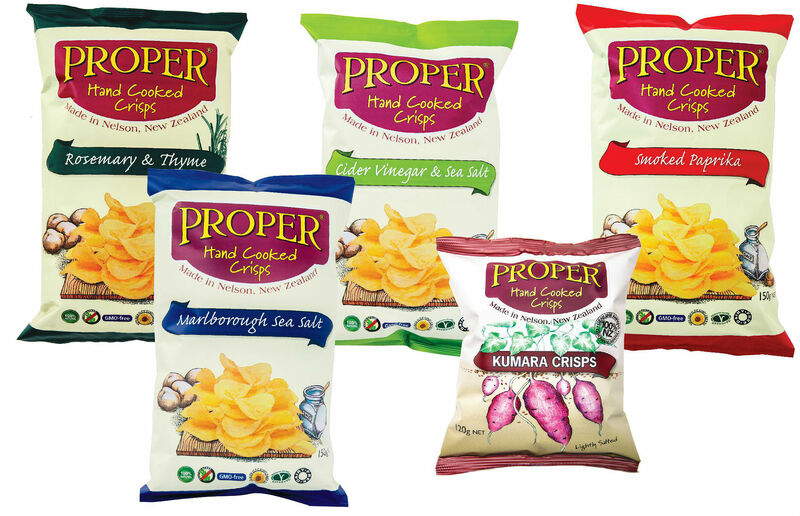 Proper Crisps are available in 5 delicious flavors, you sure will find a flavor just for you! Cider Vinegar and Sea Salt –We spent many a late night working out a specialist process that means we are able to offer you a crisp that has the genuine mouth puckering more-ishness and taste of real cider vinegar. No compromises and no nonsense, it’s the real deal in your bag. Rosemary and Thyme – We raided the herb garden! These French inspired crisps are created with real rosemary and thyme, dried and ground just prior to the cooking process, releasing their natural oils, ensuring the freshest taste and flavor possible. Smoked Paprika – Naturally dried under the romantic Spanish sun, these mature sweet bell peppers are smoked over oak chips and ground to perfection… Ole! Marlborough Sea Salt – The Agria potato is cooked in high oleic sunflower oil and lightly sprinkled with marlborough sea salt – sunshine in a bag. Kumara – The New Zealand Kumara is also know to many as the Sweet Potato. Each bag contains a seasonal medley of 100% Kaipara Kumara – Red Kumara (Owairaka), Gold Kumara (Toka Toka) and Orange Kumara (Beauregard). Next time you are craving a salty snack reach for a bag of your favorite hand cooked Proper Crisps. You can find all 5 Proper Crisps flavors at shoppri.com.